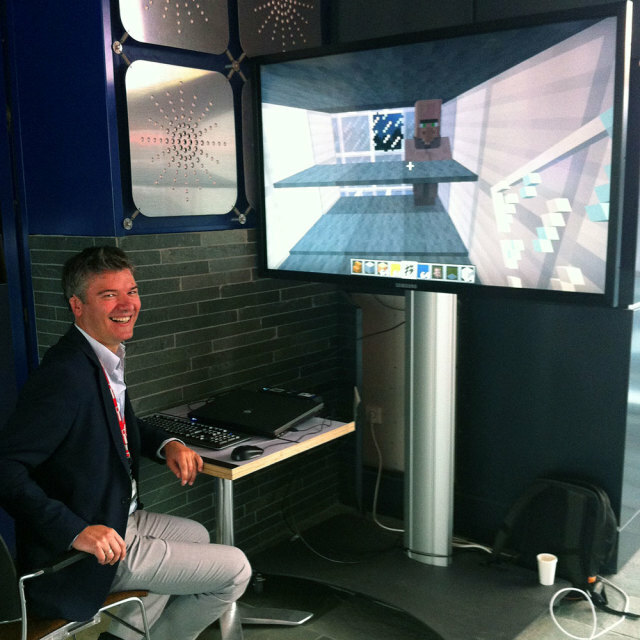 When i’m not building stuff for the web, I play Minecraft. 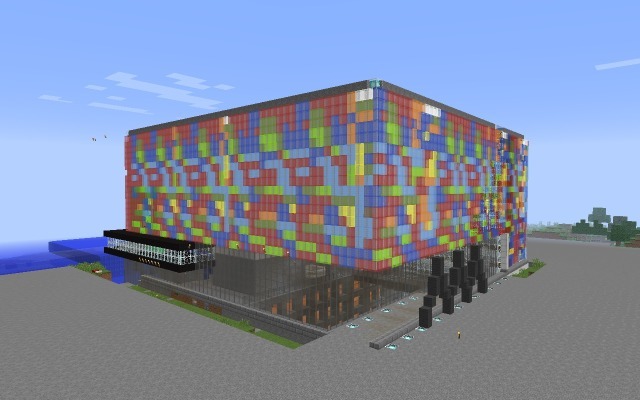 In a moment that can only be described as ‘temporal insanity’, my girlfriend and I decided to build her employer, the Netherlands Institute for Sound and Vision, full-scale in Minecraft. To answer your first question: yes, that was quite a lot of work. Around 40 hours of our shared free time i guess. Coincidentally, a few weeks later Sound and Vision organised the Retro Game Experience at their premises, so what could be a better use for our hobby project than to have a virtual recreation of the museum in the museum? 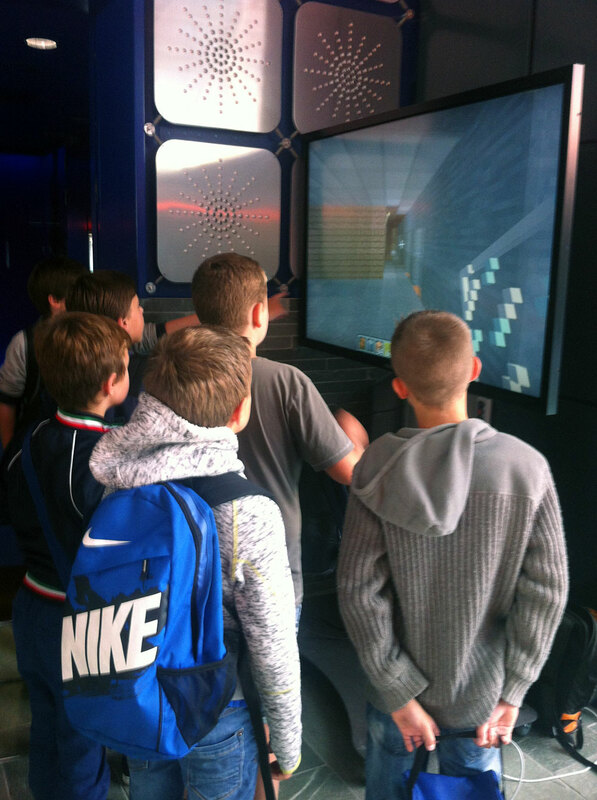 So, for three days we had this huge screen where people could play Sound and Vision in Minecraft. Here are a few things I learned from that experience. For further reference, here are a few images of the real-life thing. Reaction to the game varied broadly between age groups. Young children (between 5 and 10) were mostly interested in demolishing stuff and killing the restaurant chef. They were pretty disinterested in the fact that the building was re-created in Minecraft. Some even totally left the building and started projects of their own. Of course, there were some notable exceptions that dutifully set up their own office or put in villagers representing their entire families. Older children from 10 to 16 reacted completely different, they were very enthusiastic and highly valued the work that went into the project. They also showed me stuff that I didn’t actually knew could be done in Minecraft, such as naming villagers by putting a spawning egg on an anvil (see the Minecraft wiki for more info). We even let one exceptional Minecraft wizard build the Sound and Vision pond and fountains in the ‘master’ version, since he could not accept the fact that we hadn’t finished that part yet. Perhaps not surprisingly, the number of boys interested in the game far outnumbered the girls. Interested adults were mostly employees that wanted to see their own office, or who had children that played the game. Many children only had experience with playing Minecraft on a tablet, and needed some basic instructions how to operate the Desktop version. The same was true for many adults, but where the children usually understood the basic controls in a minute, many adults had much more trouble navigating around the world. Also, most adults didn’t how to pronounce the game and called it either Mindcraft or Mycraft. I sat next to the game for most of the time, instructing people (well, mostly kids between 5-15) and making sure all the kids that queued up got a chance to play. Using Minecraft Realms for this purpose was mostly useless. I thought it would be cool that I could walk around in the building at the same time as the visitors, but Realms has some pretty hard limits on how many times you can upload and download a world. After three downloads you need to wait for 72 hours before you can download again. Also, the fact that you’re getting kicked out after ten minutes of inactivity gets irritating pretty fast. So, actually the easiest way to have the thing operating is simply to run it locally in single player, keep a backup of the original world, and restore that every few hours. You can do development at the same time on a local laptop, and copy the new version every few hours. 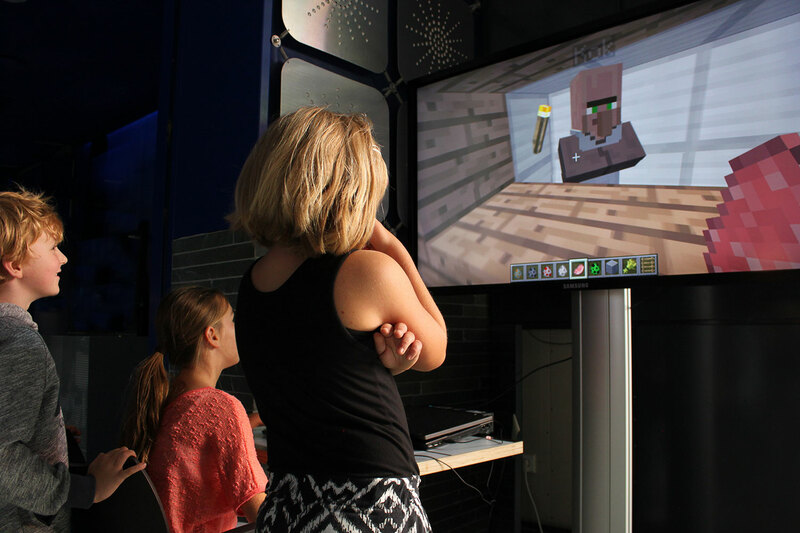 Minecraft is a complete timesink, especially for children, so make sure the museum is ok with having the kids being glued to the screen instead of looking at your collections. Having a huge TV screen for the game is pretty awesome. We had the luxury of a 65″ screen. The personnel at the entrance was replaced with horses. A complete section of the offices were demolished by fire. There was a quite a rabbit and horse problem in the restaurant. The general manager was eaten by a zombie. A rollercoaster was built in the main entrance hall. 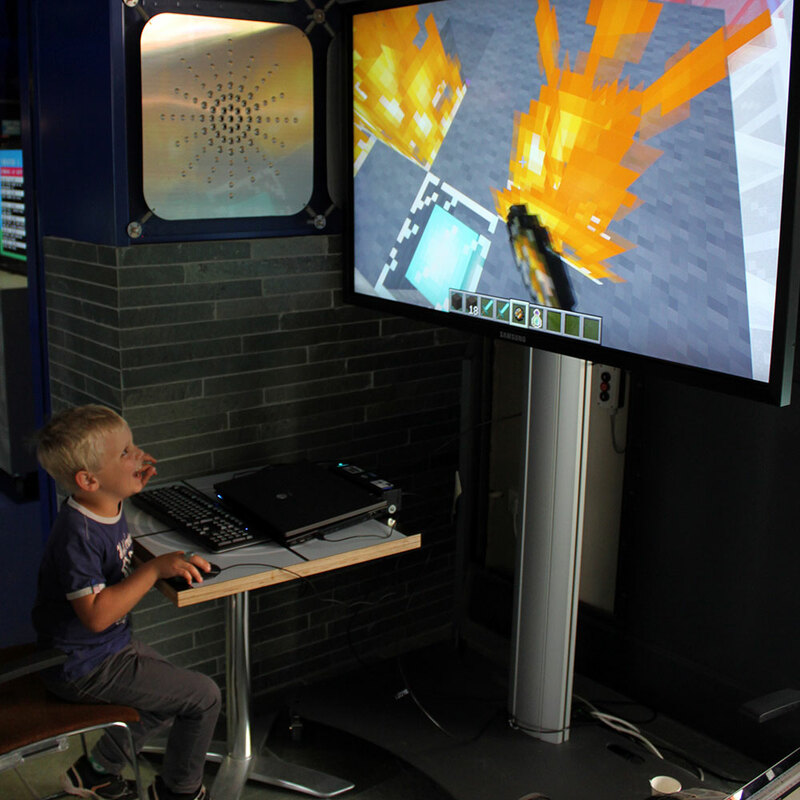 All in all, I think it was a nice experiment and showed that having a Minecraft setup in a museum can be both an entertaining and interesting experience for your visitors. 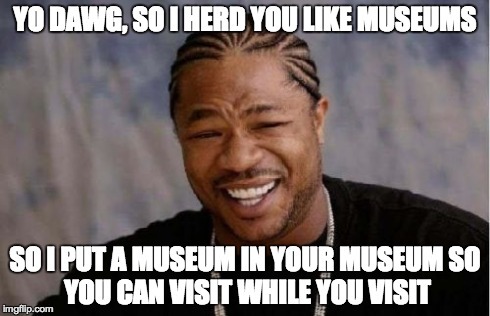 Perhaps it can even be used to ask kids to suggests improvements for your museum in your virtual Minecraft version, although you would need to spend countless hours first to recreate the actual building. What fun. Thanks for posting!